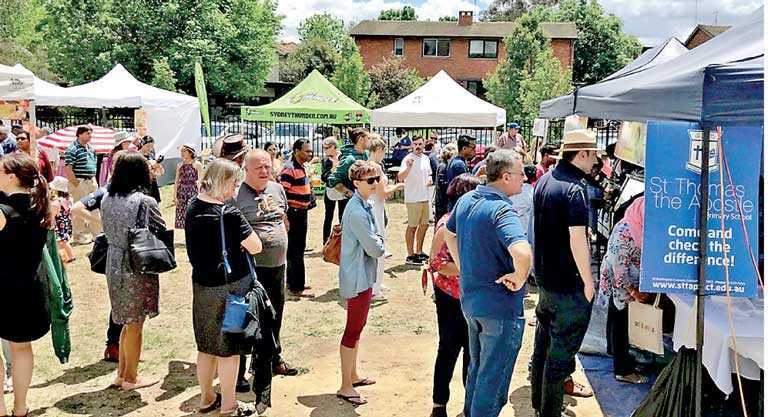 Sri Lanka Festival 2018 attracted large crowds in Canberra on Saturday, 10 November. This was the third consecutive Festival organised by the High Commission to showcase Sri Lanka to the Australian public. Thaala Asapuwa Dance Academy of Victoria presented colourful and graceful dances depicting the multicultural diversity of Sri Lanka, while dance and music items presented by local Canberra talent added value to the cultural segment. Sri Lanka Associations in Canberra were an integral part of the Festival and contributed by operating food stalls, providing publicity and selling raffle tickets. The High Commission operated stalls to promote tourism and Sri Lankan tea. Sri Lanka Tourism Promotion Bureau, Sri Lanka Tea Board and SriLankan Airlines were the main Government partners with the latter offering a return air ticket Melbourne/Colombo as the first prize of the raffle. Among the special features at this year’s festival, was the presence of Cricket ACT which set up an information stall to provide details about the historic first Test match to be played at the Manuka Oval in February 2019 between Sri Lanka and Australia, and the active participation of St. Edmund’s College, Canberra, ahead of their school cricket tour to Sri Lanka in January 2019. Multicultural Affairs Minister of the Australian Capital Territory, Chris Steel, was the Chief Guest representing the Chief Minister. He expressed appreciation that the Sri Lanka Festival brings communities together in true multicultural spirit. Simon Merrifield, from the Department of Foreign Affairs and Trade highlighted the contribution made by Sri Lankan Australians. Members of the Legislative Assembly, Australian officials, Chairman of Cricket ACT and President of the Lord Tavernier’s’ Club, diplomats and heads of Sri Lanka Associations in Canberra, Manager, SriLankan Airlines for Australia/NZ, Sri Lanka’s Consul General in Sydney, and the University of Canberra and University of Canberra College which were sponsors, were among other invited guests. High Commissioner Skandakumar, in his speech, underlined the strong ties of friendship and cooperation between Sri Lanka and Australia, and made special reference to the Sri Lankan community in Canberra for their unstinting and continued support. Proceeds from the Festival will be donated to the Little Hearts project towards the construction of a cardiac critical care complex at the Lady Ridgeway Children’s Hospital in Colombo.